all in one Quester File, with all 3 Starting Zones, active Support, very Big Routes to avoid possible Bot-Trains and alot of good Ratings. The demo contains all starting Zones up to level 9. Just start a fresh bot with it. It will detect the race of the bot and start acordingly. Level 1 to 60 support for Vanilla! - Mob 4697 and 4727 added to Desolace Part! Still waiting to get setup, but support has been awesome. Edit: I got it up and going now and he even helped me with stuff that had nothing to do with the profile. Well worth the small amount of money to get this. Great product and extremely fast service! Purchased the full version, So far its been excellent. The grinding is pretty safe, very efficient, and is a great example of how to test my fight classes. Awesome product really detailed and really good for warlocks. This profile is brilliant - I've levelled 2 characters from 1-60 using it, and made loads of gold. Also the support from Bambo's discord has been really useful - Bambo was very quick in responding to queries and helping me out (problem with wrobot not the profile). This is well worth the money, thanks Bambo. Where can I enter the ID? After pressing the pop-up window, press enter without a small window. Pls add me on discord if you have auth problems. 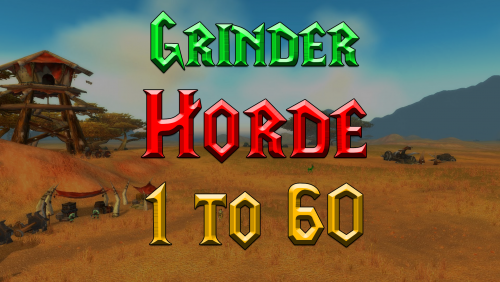 This grinder is awesome and the dev Bambo too, great support, great project, no more die, don't going to elite zone or too high level zone, that's a great work really ! continue!!! Fantastic profile. Well written as you'd expect from a "Bambo" product 🙂 Levelled from mid teens to mid 40's so far without any issues at all. Bot makes plenty of gold in the leveling process. By lvl 40 i had 220g. So enough for the mount and 120g left over! Can't argue with that! Great profile. The creator is very active on discord and very helpful with any problems. Also willing to listen to feedback. It has grinded no problem since i started and i have made about 23 gold from selling the loot. Currently, level 34 and have used it for 4 levels. So that's a great amount of gold while levelling. Got the paid version the other day. So far, everything has been good. Leveled up from 1 to 27 very smoothly with only a little over 1 day played time. The Ashenvale profile had an issue, and when reported it to the creator he said he would fix it next version. Support is good, because it's very easy to get a hold of Bambo and he seems eager to listen to what you feel will improve the profile. Of course it goes without saying that it's best to either create your own fight class if you know what you're doing, or to get one of the paid ones. I personally use my own, so results may vary with your progress. Overall, I would recommend this to whoever is trying to level up a Horde character. Just like the alliance profile, the horde profile works really well (Horde actually levels a fair bit faster than alliance due to zone convenience). The profile support is second to none. Thanks a lot Bambo, looking forward to your future profiles! Amazing Profile just passed level 40 and still going strong. Sometimes maybe a few hickups but thats what you must count on, and its probably not even the grinding profile but much your own misstake. However, this profile is simply amazing and with bambos instant replies on discord, if anything goes wrong he will help you. The profile itself is very well written. Often updated to fix bugs. I was new to the botting community and I can say that Bambo was very patient during the setup. Many things I thought were bugs actually turned out to be me lack of knowledge in the program. I'm not sure if he ever sleeps, but always responds to messages in regards to the program if there are issues. Great job, and please don't stop creating!